Here are the words so you can read them! Having completed a 20-year project and luxuriating on a honeymoon in Venice for a whole month with his sweetheart of 13 years, what does an inventor on sabbatical do? 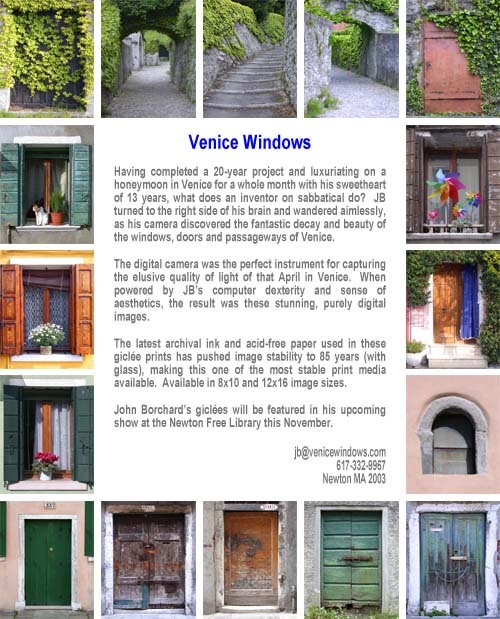 JB turned to the right side of his brain and wandered aimlessly, as his camera discovered the fantastic decay and beauty of the windows, doors and passageways of Venice. The digital camera was the perfect instrument for capturing the elusive quality of light of that April in Venice. When powered by JB’s computer dexterity and sense of aesthetics, the result was these stunning, purely digital images. The latest archival ink and acid-free paper used in these giclée prints has pushed image stability to 85 years (with glass), making this one of the most stable print media available. Available in 8x10 and 12x16 image sizes. John Borchard’s giclées will be featured in his upcoming show at the Newton Free Library this November.